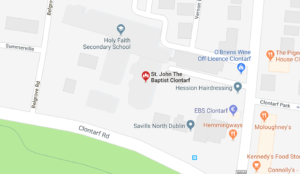 A group of parishioners is available to provide hospitality when the occasion requires, such as after certain Masses on Sunday or following various evening events in the parish centre. They generally operate from the parish centre and would welcome new members. This group provides a very important service to the parish community by working to keep the Church clean. The group meets every Monday after the 10.00 am Mass. They would welcome more members. A group of parishioners are available to deliver material from the parish to the homes of parishioners. Each person normally delivers to his or her own road. Their service is especially valuable in the week before Christmas and Easter. They would welcome more volunteers to help them. A parishioner looks after the small grounds around our church. The fruit of his work is there for all to see. Every Summer the flower beds in front of the church are a riot of colour. The role of this committee is to support the parish priest in his responsibility for the financial management of the parish. The committee meets on a regular basis to overview the financial situation of the parish and to approve expenditure when they are required. Each year all the parish financial transactions, in respect of income and expenditure, are audited and presented to the Diocesan Finance Secretariat for inspection.